It is worth remembering that Lowry has been a serious contender for major honours for the best part of five years. In 2005 he won the club championship at Tullamore and the Leinster Boys title at Skerries. But it was a member of Esker Hills that he first claimed notoriety on the international stage when he reached the semi-finals of the British Boys Championship in Norfolk. In 2006, now 19, he looked certain to lead the qualifiers on his senior championship debut when he when he signed for a five under par 66 late in the day to top the leaderboard in the West of Ireland at Rosses Point. But his joy turned to tears in the space of minutes when he discovered that he had signed for an eagle three instead of a birdie four at the par-five fifth. “I didn’t have a three there, I two putted for a four,” he said, paling visibly. “I’d better go tell them.” He then promptly headed for the scorer’s caravan where he was disqualified for a breach of Rule 6-6b - Wrong Score for Hole. Just four weeks later lightning struck twice when he was disqualified for the second time in a row in a senior amateur championship after appearing to post a best of the day 74 to take the clubhouse lead early in the third round of a rain-lashed Irish Amateur Open at Portmarnock. “It was raining hard when he came off and I checked the scores, made sure everything was correct and just threw the card in,” he said. Unfortunately, he had failed to sign it and was disqualified immediately. Things started to go right for him when he finish third in the East of Ireland at Baltray the following month and earned his senior International call up for the Home International Matches at at Pyle and Kenfig in Wales later that year. In 2007 he was third in the East of Ireland again, captured the Irish Close title in Cork and helped Ireland win the European Amateur Team Championship for the first time in 20 years at Western Gailes in Scotland, winning his singles 5 and 4. Last year was his best year ever, when he captured the West and North of Ireland Championships, the prestigious Sherry Cup and the Mullingar Scratch Cup ( by eight shots) before helping Ireland to victory in the European Amateur Team Championships and the Home Internationals. 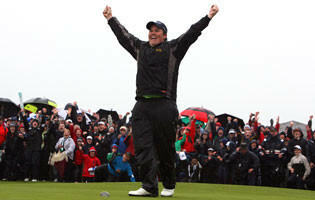 Interestingly, he also made a run for the East of Ireland title at the scene of his Irish Open victory. Bidding to emulate 1996 champion Noel Fox and bridge a 10-stroke deficit on the leader over the final 36 holes, the Esker Hills star took advantage of calm early conditions to haul himself back to level par with brilliant third round 67 that could have been even better had it not been for a closing bogey six. As eventual champion Eoin Arthurs was preparing to begin his third round, Lowry raced to the turn in four under par to get within a shot of his lead. But the Irish No 1 bogeyed the 13th and then blasted an ambitious three-wood out of bounds at the 18th to close with a disastrous triple bogey eight for a 72, smashing the offending club in anger before apologising profusely. This season he was runner up when he defended the West and has finished third in the Lytham Trophy and fifth in the Irish Amateur Open at Royal Dublin. And the plus five handicapper attributes his improvement in recent seasons to the work he has gone with the GUI’s National Coach Neil Manchip. Yesterday, he showed he has all the shots as well as the mental game to triumph at the highest level. There was no scorecard to sign this time as Lowry painted the most surreal piece of golfing art with the clubs that will serve as the tools of his trade for years to come. Shane Lowry produced that little bit of magic that separates the good players from the true champions to take his place in the semi-finals of the West of Ireland Amateur Open Championship at Rosses Point. Shane Lowry can take a huge step towards clinching his place in the Great Britain and Ireland Walker Cup side by ending Ireland’s six-year wait for a home winner of the Irish Amateur Open at Royal Dublin. Shane Lowry uttered the words Great Britain and Ireland Walker Cup captain Colin Dalgleish was dreading yesterday. If that’s not a clear message of intent to skip having a bash at the Americans in September, what is? Irish Open hero Shane Lowry will take the plunge into the pro ranks next week. That's the view of a source close to the Offaly ace, who revealed that Ireland's third European Tour winner this season will make his debut in the European Open at The London Golf Club in Kent from May 28-31. 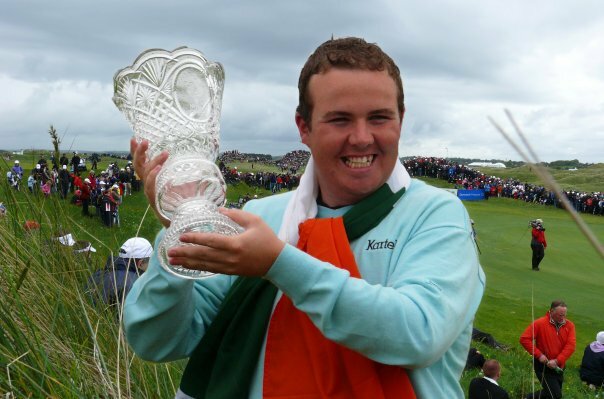 Shane Lowry will soon be bidding for more titles on tourThe news will be a blow to Walker Cup skipper Colin Dalgleish, who was hoping to have the 3 Irish Open champion on the 10-man Great Britain and Ireland side bidding to win back the trophy on American soil in September. Speaking yesterday, Lowry hinted that he wouldn't be able to resist the lure of the megabucks Race to Dubai and the chance to take on pals Rory McIlroy and Chris Wood every week. Shock Irish Open winner Shane Lowry has given his one of his amateur pals the secret to his amazing success - his Baltray strokesaver.